However, the protestors remained steadfast — and peaceful. In spite of the threat to the sacred land and the unscrupulous action of the state in taking that land on behalf of big oil, government officials maintain their justification. On Saturday, the group appealed to the United Nations in a last stitch effort to prevent their land from being taken from them and given to Energy Transfer Partners. 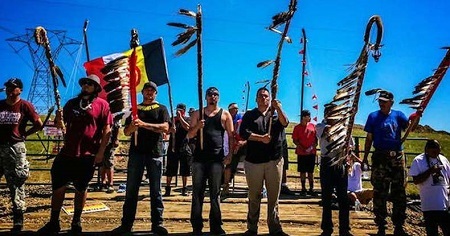 “We specifically request that the United States Government impose an immediate moratorium on all pipeline construction until the Treaty Rights and Human Rights of the Standing Rock Tribe can be ensured and their free, prior and informed consent is obtained,” Chairman Archambault and the Treaty Council said in their appeal to top U.N. human rights officials. As a matter of extreme urgency, the Standing Rock Sioux Tribe and Treaty Council jointly submitted an urgent action communication to four U.N. human rights Special Rapporteurs citing “ongoing threats and violations to the human rights of the Tribe, its members and its future generations.” The tribe’s water supply is threatened by construction of the Dakota Access pipeline, which was permitted by the U.S. Army Corps of Engineers in late July, despite the objections of three federal agencies including the federal Environmental Protection Agency, the Department of the Interior and the Advisory Council on Historic Preservation. The hearing is scheduled for Wednesday in Washington D.C. on the tribe’s request for an injunction. The Dakota Access pipeline violates tenets of the U.N. Declaration on the Rights of Indigenous Peoples, including the “right to health, right to water and subsistence, threats against sacred sites including burial grounds, Treaty Rights, cultural and ceremonial practices, free prior and informed consent, traditional lands and resources including water, productive capacity of the environment, and self-determination,” the appeal said. It cites environmental racism stemming from the Army Corp’s decision not to locate the pipeline north of Bismarck over concerns it would endanger the city’s water supply, while issuing permits to trench through burial grounds and the Tribe’s main water supply. This is a direct violation of the human right to water, the appeal said. “This submission calls attention to the urgent and worsening threats and violations of the human rights and ways of life of Standing Rock Sioux Tribe who depend greatly for their means of subsistence and their physical and cultural health upon the Missouri River,” the appeal said, citing a myriad of oil spills and leakages. “The executive order can help the state and local agencies manage costs associated with providing a heightened law enforcement presence and activates the State Emergency Operations Plan to coordinate the efficient flow of resources,” read the press release. However, the thousands of people from the Standing Rock Sioux Tribe remain peaceful — in spite of government provocation. It also raises the question as to why taxpayers are footing the bill to protect the billionaires building the pipeline. In Iowa, similar protests against the pipeline are underway by multiple farmers who are arguing that the state’s use of eminent domain for the Dakota pipeline is in violation of federal law. The farmers have filed a lawsuit noting that the Dakota pipeline is a private company and not a utility and that Iowa would not even have distribution points. What this pipeline represents is the corporatocracy’s grip over the rights and property of individuals. By a simple government decree, a private corporation can usurp the property rights of individuals to bolster their bottom line. The bravery by those standing against the government stealing their property on behalf of big oil is conveniently being ignored in the mainstream media. Please share this story with your friends and family so that they can see what fighting tyranny looks like. Photo: The Camp of the Sacred Stones has swelled from a few dozen to more than 2,500, according to Standing Rock Sioux Tribe officials. They are calling for further review of the Dakota Access oil pipeline, approved by the U.S. Army Corps of Engineers at the end of July without a full environmental assessment. Source: Indian Country Today.